Ed note: Reprinted with permission from Train Strong to Remain Strong and in honor of the many new kiddos we have joining our Ohana! 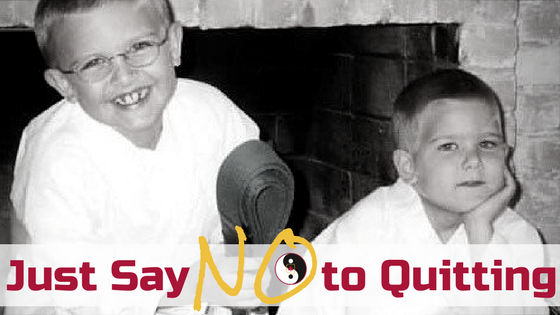 My husband and I decided that martial arts was an activity our children would participate in. We were the adults and guardians of our children and we had the education and experience necessary to make such an informed decision. And we had the authority to make it stick. There were countless other times that they wanted to quit, and a countless variety of reasons. We knew, based on our education and life experience, that they only felt like they wanted to quit. At that moment. Because it was easier. It was in those moments that we became parents. We had to be the educated and experienced adult parent that our child needed. At each excuse, each pleading, each session of a child rationalizing, crying, and gnashing teeth, we sincerely thought about it. Is he physically able to do the work? Is he mentally able to do the work? Will the work benefit him now? Will the work benefit him later? The answers were always yes. So, we did not give up on our kid. Nor did we allow him to give up on himself. They probably hated us. They probably rolled their eyes behind our backs. They probably complained to their friends who in turn told their parents (which explains how our reputation as militant dictators always preceded us). They probably said a million times how they would NEVER make their kids do anything they did not want to do. Believe me, it was tough. But so is life for a quitter. Doing the tough stuff was worth it. My sons are confident enough to not be quitters. My sons can push through physically challenging tests of life. My sons can push through mental and emotional challenges knowing they have experiences overcoming obstacles and tough times. My sons can manage a busy schedule. My sons can negotiate the tricky “want now” versus “benefit later” paradox. My sons can reach goals and self-motivate. And help others do the same. My sons have a respect for those who run small businesses. My sons are not afraid of hard work and look for opportunities to do so. And guess what? They LOVE martial arts. They always did. They just did not love it at that moment when perhaps they needed to make a choice or felt stressed or saw a shiny distraction beckoning them. It did not have to be martial arts. It could have been competitive swimming or baseball or speaking Mandarin or cooking. The activity did not matter but the life skills acquired did. In my boxes of artwork, pictures, awards and school mementos, I do not have anything indicating I was my son’s best friend. It’s okay. I look at their current life situations and successes and I know I had a part in making that happen. Moral of the story: What’s hard in the beginning usually turns out to be easy in the end. And unfortunately, vice versa.